The story of Joseph in Genesis teaches so many lessons. First, it is a type, a message of the redemption paid by our Savior Jesus Christ. Each of us is a brother begging for bread in a time of famine, while Joseph represents the Savior – freely forgiving and offering us safety. Both Joseph and Jesus are obedient to their fathers, both are hated by their peers, are stripped of their robes, are sold for silver pieces, falsely accused, and are saviors to their people. To read the story and not see Jesus Christ on these pages is to miss the message. Within this story there are insights that apply to us as we pass through various stages of our lives. I enjoyed examining how Joseph dealt with the envy of others as he went through his life experiences. 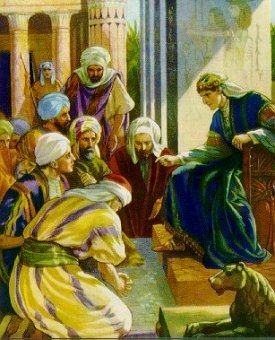 In Genesis 37:5 it reads, “And Joseph dreamed a dream, and he told it his brethren: and they hated him yet the more.” In this dream Joseph outlines how he will one day rule over his brothers. Not getting a positive response, we read that he tells his brothers of another dream detailing how he will one day be in charge. The result of this exchange is that his brothers “conspired against him to slay him” (Genesis 37:18). Clearly the Green Envy Monster is lurking in the shadows, ready to strike out at the hero in the last chapters of the book of Genesis. It has been said that envy is the tax which all of distinction must pay. When asked if they have ever had a situation where the envy of others has caused them intense grief, it seemed to be a universal response – envy has bitten us all at some point in our lives. The story of Joseph gives us guideposts to measure how to deal with the green monster as well as ways to keep him at bay in the future. Giving credit to others as we find success in life is something that Joseph has learned through experience. He saw the hand of the Lord in his life and knew that his ability to influence the leader of the Egyptian empire was a gift from God. He also handled the Pharoah in the right manner upon meeting him for the first time. No longer was this the 17 year old bold youth ready to let Pharoah know who had the favor of God. The man Joseph had been seasoned by experience and refined in the crucible of a telestial unforgiving world. He says to the ruler of Egypt, “Now therefore let Pharoah look out a man discreet and wise, and set him over the land of Egypt… and take up the fifth part of the land of Egypt in the seven plenteous years…” (Genesis 41:33-34) Joseph could have recommended his services to the king, but I believe that he knew that this would not be a wise option. Deferring to the intelligence of the king, he outlined a suggested plan, and being wise, let the Pharoah come to his own conclusions. Learning how to work with people is a delicate process. It takes experience to learn how to work with each other. In this endeavor we will find ourselves in situations where others will not like us for a variety of reasons. Joseph shows us how to handle these situations with grace. Not only do we witness him making very human mistakes, we see him mature into a leader and a prophet as we go through the last chapters in Genesis. This entry was posted in Happiness, Old Testament and tagged applying the scriptures, applying the story of Joseph, Genesis, jealousy, Joseph of Egypt, LDS youth, seminary teaching ideas. Bookmark the permalink.